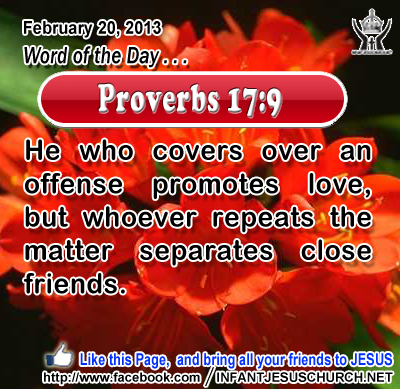 Proverbs 17:9: He who covers over an offense promotes love, but whoever repeats the matter separates close friends. Heavenly Father, we confess that we are often more a peace lover than a peacemaker. Give us the character not to repeat gossip and instead have the wisdom and power to be an offense mender. Through the Infant Jesus we pray. Amen. 29When the crowds were increasing, he began to say, "This generation is an evil generation; it seeks a sign, but no sign shall be given to it except the sign of Jonah. 30For as Jonah became a sign to the men of Nin'eveh, so will the Son of man be to this generation. 31The queen of the South will arise at the judgment with the men of this generation and condemn them; for she came from the ends of the earth to hear the wisdom of Solomon, and behold, something greater than Solomon is here. 32The men of Nin'eveh will arise at the judgment with this generation and condemn it; for they repented at the preaching of Jonah, and behold, something greater than Jonah is here. The Lord Jesus came to set us free from slavery to sin and upsetting desires. God searches our hearts, not to condemn us, but to show us where we require his saving grace and help. Through the gift of the Holy Spirit he pours his love into our hearts that we may welcome his will for our lives and walk in his way of holiness. He calls us to look for him with true repentance, humility, and the sincerity to see our sins for what they really are - a refusal of his love and will for our lives. God will transform us if we pay attention to his word and allow his Holy Spirit to work in our lives. Ask the Lord to renovate your mind and to increase your thirst for his wisdom. James says that the wisdom from above is first pure, then harmonious, gentle, open to reason, full of mercy and good fruits, without doubt or insincerity. A double-minded person cannot receive this kind of wisdom. The single of mind wish one thing alone - God's pleasure. God wants us to delight in him and to know the freedom of his truth and love. Do we thirst for the holiness with no one will see the Lord? Loving Infant Jesus, change our heart and fill us with your wisdom that we may love your ways. Give us grace and courage to resist temptation and stubborn willfulness that we may truly desire to do what is pleasing to you.